On Friday 31st March the Chilcote boys' football team played against Wheelers Lane school at Yardley Wood playing fields. The match was their third in the South Birmingham Division 1 league. The game started well for both teams with both sets of players creating chances. Wheelers Lane began to dominate the match as the first half wore on and the Chilcote keeper was certainly the busier of the two. Then, just before the break Wheelers took advantage of some slack marking from Chilcote and scored to go in 1v0 up. After half time Chilcote conceded almost straight away. Again some sloppy marking left the Wheeler's striker open to shoot at goal and he took full advantage. Chilcote then began to play better and created some opportunities of their own. The Wheeler's keeper stood firm and wouldn't le the ball go past him. Wheelers missed a penalty midway through the second half before scoring the best goal of the night - a long distance effort that went into the top corner. Chilcote did manage to get a consolation at the end of the game to make the final score 3v1. Well done to all of the boys who played in the match they gave everything!!! We had a lovely day today in Reception on Red Nose day. Everyone wore their own clothes and lots of red to help us raise money for Comic Relief. Thank you to everyone who donated. Here we all are with our red noses! We had a lovely morning with Collette from `Create-Build-Learn`. We named, then created lots of different types of individual dinosaurs. Next we worked in teams of 3 to make suitable habitats for our dinosaurs to live in. Our habitats needed to provide the correct conditions for life- the children had to think hard and plan a habitat which had water, plants,trees and somewhere for the dinosaurs to shelter. 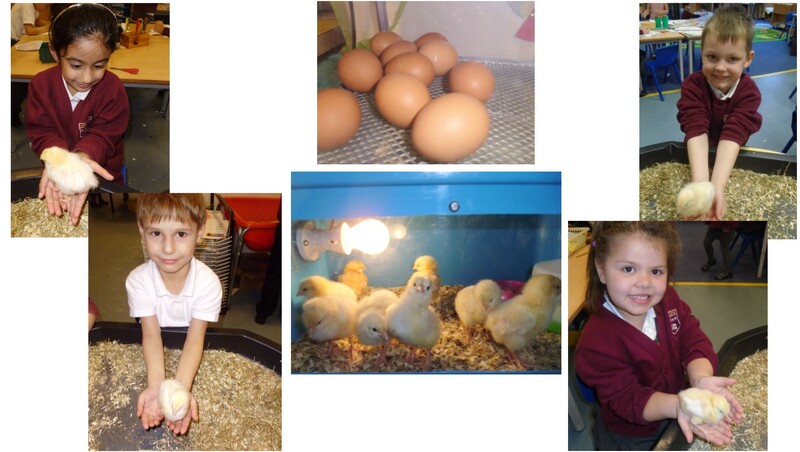 All the children were very involved and worked enthusiastically in their groups. They were very creative and made and described some amazing models. Thank you very much to Collette- we thoroughly enjoyed our morning and are very proud of our creations! On Thursday 2nd March, there were a wide variety of wonderful book characters wandering around in Year 6. The fantastic costumes ranged from Gangsta Grannies (from David Walliam’s novel ‘Gangsta Granny’) to The Queen of Hearts (from Lewis Carol’s ‘Alice in Wonderland’) to Newt Scamander (J.K. Rowling’s fictional author of ‘Dangerous Beasts and Where to Find Them’). J. K. Rowling’s characters were particularly popular, so much so that the year 6 classrooms looked more like Hogwarts than Chilcote! Staff from year 6 came dressed as characters from the year group novel ‘Goodnight Mister Tom’. One activity from the day involved the children learning a poem off by heart. As Year 6 have recently been researching and writing about animal rights in English lessons, they learnt ‘Blake’s Tiger Revisited’ which is a poem about how tigers in captivity gradually lose their colour. The poet took inspiration from William Blake’s ‘The Tyger’ and the children had the opportunity to compare the two poems. Once they had performed their memorised poems, the pupils had the chance to take part in a poetry workshop with a visiting young poet called Jess. After listening to some of her originals and playing rhyming games, the children wrote their own poem entitled ‘I came from…’ which they shared with one another. Year 3 have had a wonderful time celebrating World Book Day. We all came to school in wonderful costumes of our favourite book characters. Even the staff dressed up as the characters (and objects) from the poem The Owl and the Pussycat, which we have been looking at this week. We spent the day learning the lines for the poem, so that we could perform it off by heart. We talked lots about the things we needed to do to make our performance a good one, and then we had the chance to put our skills into action when we performed for Year 4 in the afternoon. Year 4 were so impressed that we were able to recite the poem without looking at the words, and they enjoyed the actions we included using our puppets. We loved listening to them recite Chocolate Cake - a poem we find very funny! Everyone had a great day learning lots about poetry, and reading in general, and we look forward to exploring poetry further over the next few weeks.